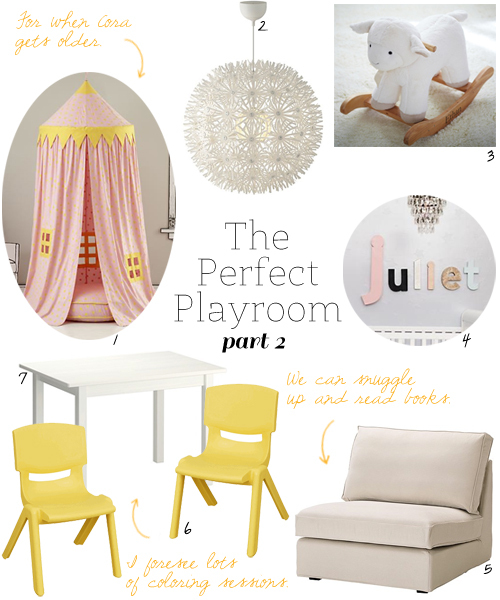 A playroom should be a place where the imagination can run wild (or as much as it can without injury), right? That's the kind of space I want for Cora. I want her to be able to create, play make-believe, and invent ideas of her own. Here are a few more items that I think will help her do just that. These are just the large pieces that we want in there (there will surely be lots of toys), so I kept the color palette somewhat neutral. I didn't go too crazy with color since I know the toys will add all the color we want/need. Oh, and I can't believe I didn't mention this earlier, but the wall color is very similar to Behr's Ashwood. Forgive me, I don't know the exact color at the moment, the leftover paint is buried somewhere in the garage, wah wah. We still have to clear out the current guest room (hopefully doing that during the evenings when Cora sleeps), but once we do that, we'll start adding the new pieces in. Can't wait to get started! ** Here's the paint color of the guest room - Behr Garden Wall. love the pieces! can't wait to see the finished product. i still need to finish ours...now how to get all three to nap at the same time? !